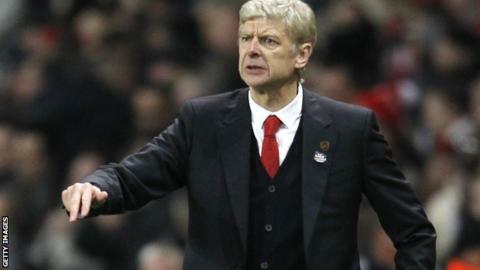 Arsenal manager Arsene Wenger doubts whether match-fixing will ever be eradicated from football. He spoke as two men appeared in court charged over alleged match-fixing in the English game. The Gunners boss believes England is "99.9% clean" but says lower-league teams are more vulnerable. "Can it be eradicated completely? I am not sure," the Frenchman said. "We absolutely have to fight against that with the strongest severity." The exact details of the latest match-fixing allegations are not known and cannot be commented on due to the ongoing legal action. In other cases, however, international betting syndicates - invariably Asian - often dispatch a fixer to search out semi-professional, non-league players in the lower tiers of English football who may be susceptible to bribes. The players, once identified, are then typically handed thousands of pounds in return for manipulating a game - from the number of goals scored to the number of yellow cards issued. For the fix to work, the syndicate tends to need more than one player to be in on the scam. The fixer, sat watching in the stands, then waits for the signal from their co-conspirator on their pitch. If the scam is to go ahead, the player on the syndicate's payroll deliberately gets a yellow card at the start of the match. The fixer then calls his investors in Asia and tells them the fix is on. Bets are then placed. Singapore national Chann Sankaran, 33, and 43-year-old Krishna Sanjey Ganeshan - who has dual UK and Singapore nationality - are charged with conspiracy to defraud. Mr Sankaran and Mr Ganeshan, who are alleged to be members of an illegal betting syndicate based in Singapore, are accused of committing the offences in "Manchester and elsewhere". Magistrates remanded them to appear at Birmingham Crown Court on 13 December. Four other people arrested earlier this week were bailed on Thursday pending further enquiries. At least three footballers are reported to be among those held across the country. Sources have told the BBC that one of the other suspects is former Premier League player Delroy Facey, who is now a football agent. Wenger was manager of Monaco when Ligue 1 rivals Marseille - the 1993 French champions and European Cup winners - were found guilty of corruption before being relegated and thrown out of European competition by Uefa. "Once you don't know if everyone is genuine out there any more, that is something absolutely disastrous," he said. Professional Footballers' Association chief executive Gordon Taylor says cases of lower-league footballers being approached by match-fixers are extremely rare but the sport must remain vigilant. "Education is in place so that players know the dangers and they are encouraged to report any incidents, so the correct procedures can be followed," he told BBC Sport. "Temptation will always exist and people will take advantage of that, but a monitoring process is in place and we will continue to work with the authorities on this to protect the integrity of the game." Wenger hopes the current incident under investigation is an isolated one. "Maybe the lower divisions are a bit more under threat because it is a bit more anonymous, there is less money so it is easier to buy people, but I don't think that exists in the Premier League at all," he said. "I don't believe that in England people fix matches, but we live in an international world and you cannot just stop it at the border any more. It is a new problem that we all face. "I still think that 99.9%, the English game is completely clean. "When you see the happiness of the players when they score goals, even in the lower divisions, the passion of the fans when I was at Barnet for example, I can't believe there is a match-fixing problem in England."